Aim: The study aimed to assess the prevalence of Listeria spp. in raw milk and traditional non-pasteurized dairy products in Isfahan, Iran. Materials and Methods: A total of 292 samples of raw milk and traditional dairy were examined for the presence of Listeria spp. using a two-step selective enrichment recommended by the United States Department of Agriculture. All isolates were subjected to standard biochemical tests. L. monocytogenes strains were further confirmed by polymerase chain reaction (PCR) amplification. Results: Of 292 samples, 21 (7.14%) and 4 (1.47%) were positive for Listeria spp. and pathogenic L. monocytogenes, respectively. The prevalence of Listeria spp. in raw milk, ice cream, cream, and freni were 5.91 (5.49%), 12.63 (19.04%), 3.27 (11.11%) and 1.25 (4%), respectively. Listeria was not detected from yogurt, butter, Kashk, and cheese. 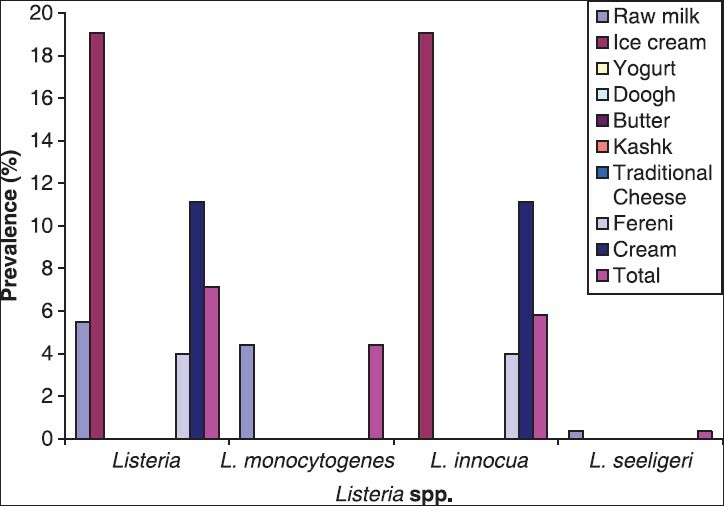 Listeria innocua at 16.21 (5.44%) was the most prevalent species isolated, followed by L. monocytogenes at 4.21 (19%) and L. seeligeri at 1.21 (4.7%). All strains of L. monocytogenes identified by biochemical tests were also confirmed by PCR. Conclusion: The study shows the prevalence of L. monocytogenes in raw milk and traditional dairy products sold in the market. Consumption of raw milk with mild heat treatment or its usage in traditional dishes could pose serious health problems due to lack of appropriate control measures. The lack of knowledge on the risks of listeriosis transmission indicates the need for implementation of a food safety education program. In addition, the Iranian food safety authorities should urgently set up an effective standard to screen all susceptible food products for the presence of Listeria.